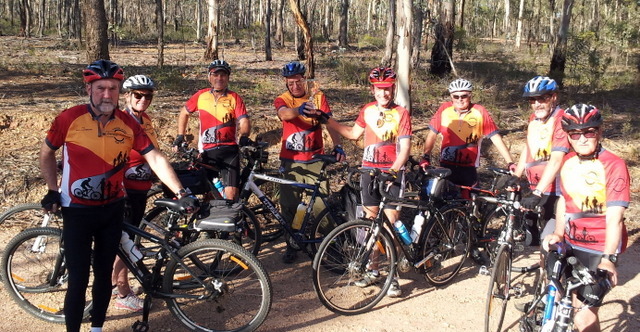 Need an excuse to ride a rail trail in the early hours of the morning, to be close to nature, watching kangaroos feed, and hearing birds calling to wake the morning? One of the events in the inaugural Heathcote Community Games saw riders participate in the Fazzi Relay Cup. The towns of Tooborac, Lancefield, Mia Mia and Heathcote were all part of the multi user relay event that started on Friday 20th and finished on Saturday 21st February. Being passed the rather large silver Fazzi Cup at 7:30am, the road riders headed off from Mia Mia bound for the ‘CBD’ of Derrinal, a hilly distance of 21kms. 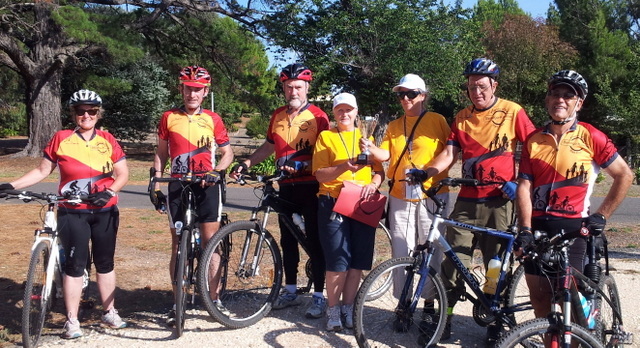 Upon reaching the Derrinal area, the cup was passed onto the next group of cyclists who would ride the O’Keefe Rail Trail. Not being fazed by a broken down car and trailer with horse blocking the trail in a cutting of the One Eye Forest, the riders were determined to ensure that the cup should reach its destination in time. Needing to bypass the blockage, some fast pedalling was required to make up time through the forest. With the relay’s support vehicle needing to make a longer bypass, it rejoined the riders near the historic Heathcote cemetery. From here the relay walkers cup carried the revered Cup into the pop-up park at Heathcote’s Games Central to finish the event. Congratulations to the Games organisers for their volunteer commitment, lack of sleep and efforts, as the relay event was a bit of fun. Many in Heathcote that weekend spoke about looking forward to next year’s Games.